Before fitbits and jawbones and mall speed-walkers, there was the type of gumption to pull oneself up by their literal bootstraps (or, in this instance, Keds), inspired by having eleven children and enduring an abusive relationship. 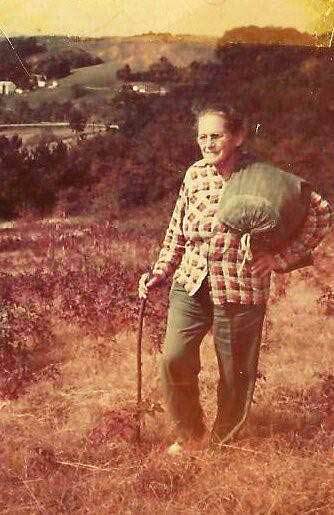 Grandma Emma Gatewood was an Ohio farmer’s wife, mother of eleven, and grandmother of twenty-three. At the age of 67, she was the first woman to hike the 2,168-mile Appalachian Trail from Georgia to Maine solo. She did it in 1955, wearing only sneakers, an army blanket, a raincoat, a plastic shower curtain for shelter, a cup, first aid kit, and one change of clothe–all carried in a homemade bag. Her hiking diet is told consisted mainly of dried beef, cheese and nuts, supplemented by wild food she would find along the way.